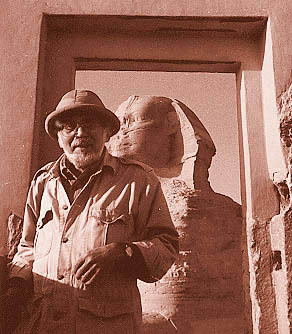 One of the most fascinating and brilliant researchers and alternative historians, on the ancient Egyptian world, simply must be John Anthony West. His work has truly revitalized many people’s understanding of ancient Egypt, a subject which is often clouded by the uninspired and often dim witted theories of the modern-day quackademics in the field of Egyptology. West is well known for his work with actor Charleton Heston and geologist Robert Schoch on Mystery of the Sphinx; a documentary which details his theory that, due to evidence of water erosion on the Sphinx, this monument must be thousands of years older than is currently believed by the academic Egyptologists. He also made a fantastic documentary called Magical Egypt, which is a Symbolist view of the ancient Egyptian world. This video features John Anthony West speaking at a conference; it only recently became available on the web. The video was excerpted from a conference called Return to the Source : Rediscovering Lost Knowledge and Ancient Wisdom. In the lecture, he explains his theories on ancient Egypt, detailing the manner by which his truly independent perspective was developed: his influences, experiences and how his understanding of symbolist Egypt evolved over the many years of his career. Architecture does in stone what music does in sound; in other words, its visual vibrations that are affecting us. We’re inside the symphony, as it were, when we’re inside a sacred space. We’re being affected emotionally by the vibrational nature of that particular building. So when we go into an Egyptian temple, we are resonating to its harmonies and proportions and so-on. The great sages of the past understood that each of the cosmic principles, which are the gods as it were. The gods are not some strange animal headed beings, they are the embodiments of cosmic principles and those cosmic principles are inextricably related to certain interplay of numbers which give rise to geometry, harmony, proportion and measure. When you know the secrets of the numbers and secrets of the principles, you are able to produce a building that will evoke within the emotional center of the beholder, that particular principle. The search for the location of or information regarding Atlantis has occupied great minds for thousands of years. Psychics such as Edgar Cayce and Helena Blavetsky spoke of Atlantis in their readings. Adolf Hitler searched for the descendants of the white race of spiritual masters said to have descended from the Atlantean priesthood. The psychic reading, given in 1932, on the Sphinx and Great Pyramid at Gizeh, is one of the most fascinating readings about the origins of the ancient world. There are many perplexing mysteries concerning the construction and purpose of the monuments of ancient Egypt and South America. What is Atlantis and How Does it Relate to Us? Often the question comes to mind, “how did this high level of cultural and technological advancement come about?” Scientists and historians will have you believe that hundreds of massive pyramids worldwide appeared: at around the same time, with simmilar characteristics, a common measuring unit (the cubit) and with no anticeedent advances. Given all of the unexplained artifacts which have already been unearthed and continue to be unearthed; artifacts such as precision carved vases and sculptures, which could not have even been carved with today’s technology, Egyptian inscriptions portraying the use of advanced technology and precision mathematics built-in to most of the world’s great stone monuments and temples, it is no small wonder that people who are willing to venture out of orthodoxy are becoming increasingly convinced that a revisionist view of history is the only way to make sense of all of this.